A real eye-catching multi-purpose garden planter. Hand wash painted silver over black to create a classic and stylish pot. Perfect for housing a whole host of flowers, trees, shrubs and bulbs. Ideal for planting standard trees & shrubs and placing by doorways, pathways and around patios. Supplied as a single planter, 25cm (10in) diameter, made from heavy duty polypropylene with drainage holes. 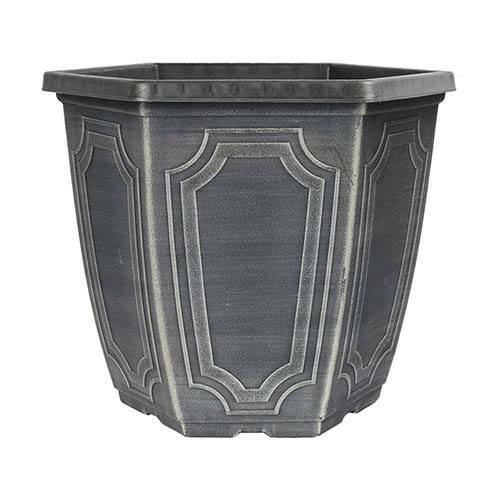 This decorative yet long-lasting, mid-size plastic planter has a really eye-catching design and are handwash painted silver over black to create a classic-looking, chalk-effect pot, perfect for planting up a whole range of flowers, trees, shrubs and bulbs. The contemporary ‘Estate’ design with a subtle finish will add a touch of grandeur to any garden, big or small, especially when planted up with feature plants like standard trees and shrubs or architectural golden cypress or phoenix palms. Place by doorways, pathways and around patios to create an eye-catching display that won’t go unnoticed. Width: 25cm (10in), Height: 19cm (7.5in), Volume 5L (approx dimensions). Supplied as a single pot made from a durable UV-stable and frost-resistant plastic, and hand painted with a chalk wash finish.